Cold-Fusion billet throttle control. 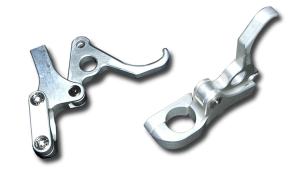 We have taken our favorite features found in levers from days gone by and combined them into this billet lever setup. Slim design to fit next to those superflip bars and a rounded bottom to save the kneecaps. Adjustable stop to take up the slop, and of course Cold-Fusion quality.